The global big data market is forecasted to grow to 103 billion U.S. dollars by 2027, more than double its expected market size in 2018. With a share of 45 percent, the software segment would become the large big data market segment by 2027. Big data is a term that refers to the kind of data sets that are too large or too complex for traditional data processing applications. It is defined as having one or some of the following characteristics: high volume, high velocity or high variety. Fast-growing mobile data traffic, cloud computing traffic, as well as the rapid development of technologies such as artificial intelligence (AI) and the Internet of Things (IoT) all contribute to the increasing volume and complexity of data sets. Advanced analytics tools, such as predictive analytics and data mining, help to extract value from the data and generate new business insights. 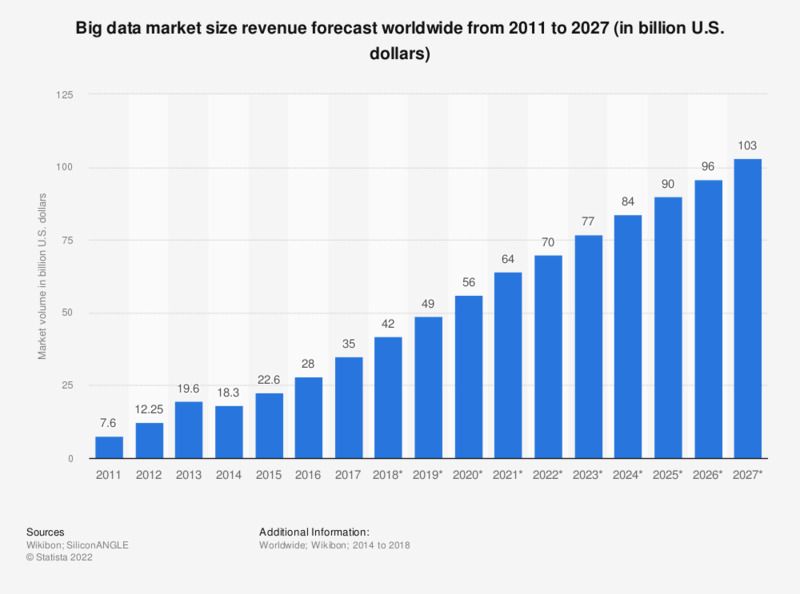 The global big data and business analytics market was valued at 169 billion U.S. dollars in 2018 and is expected to grow to 274 billion U.S. dollars in 2022. As of November 2018, 45 percent of professionals in the market research industry reportedly used big data analytics as a research method. The values are based on the relevant software, hardware and services segment revenues.